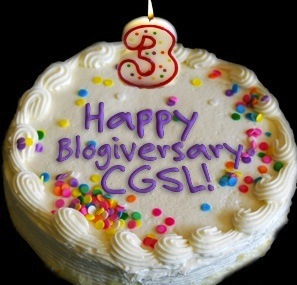 California Genealogical Society and Library blog: Happy Third Blogiversary! Can you believe it? It's been three years! It's time to thank all the member volunteers who contribute to the blog by taking photographs, passing along information and writing up their travels and genealogy adventures. Thanks to my friends in the genealogy blogging community for your support. And thanks to all of my blog readers! HAPPY BLOGAVERSARY TO YOU, HAPPY BLOGAVERSARY TO YOU, HAPPY BLOGAVERSARY DEAR CGS AND SISTER MARY KIIITTTTTYY, HAPPY BLOGAVERSARY TO YOUUU! Happy blogiversary! I'm proud to be a member of such a great society with an award-winning blog. Thank you for all your hard work to make it happen! Happy 3rd Blogiversary to the California Genealogical Society and Library. I always enjoy seeing your many photos and reading your posts. I grew up in Alameda, my sisters born in Oakland, so even from MA, I feel a connection! Congratulations on turning 3! May you have many more Blogiversaries. Happy blogaversary to a wonderful group of which I'm so proud to be a member! MWAH! Wow, you are three already? Wonderful three years! Happy Blogiversary! Looking forward to all of the future years! Great job Kathryn!